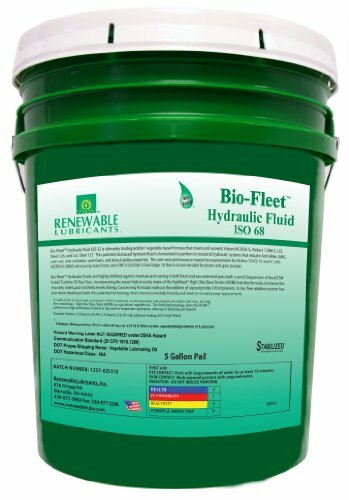 Renewable Lubricants Bio-Fleet hydraulic fluids are ultimately biodegradable1 vegetable based formulas that meets and exceeds Vickers M-2950-S, Vickers 1-286-5, U.S. Steel 126, and U.S. Steel 127. These patented biobased hydraulic fluids are formulated to perform in fleet, marine, and industrial hydraulic systems that require Anti-Wear (AW), anti-rust, anti-oxidation, anti-foam, and demulsibility properties. An environmentally friendly, zinc-free additive system has also been developed that meets or exceeds high pressure pump requirements. The anti-wear performance meets the requirements for Vickers 35VQ-25 and V-104C (ASTM D-2882) vane pump stand tests, and exceeds DIN 51524 Part 2 load stage 10 that is recommended for piston and gear pumps. Bio-Fleet hydraulic fluids are the perfect economical choice for hydraulic equipment operating outside, where unpredictable higher moisture and dusty environments are more prominent and the equipment require more frequent oil change intervals. They are highly inhibited against moisture and rusting in both fresh and sea water, passed both A and B Sequences of the ASTM D-665 Turbine Oil Rust Test, and they provide excellent water separation as shown in ASTM D-1401 Demulsibility Test. Incorporating the super high viscosity index (VI) of the Stabilized High Oleic Base Stocks (HOBS) into the formula, increases the VI past synthetic levels (Energy Conserving Formulas). In addition, this super high VI naturally improves the thermal and mechanical shear stability of the formula and provides additional fluid protection under higher loads and pressures. The HOBS's extremely low volatility increases the flash and fire safety features in the formula. These biobased fluids are designed to provide seal conditioning for longer seal life and to reduce oil leakage from the system. Bio-Fleet hydraulic fluids should be used in hydraulic applications where low toxicity and Biodegradability properties are required.